Dario Fo in front of his audience at Palazzina Liberty, Milan. Source: European Collected Library for Artistic Performance. In Nowak’s discussion of ‘new’ public theatre, he was clearly trying to show that its novelty doesn’t simply consist of the idea that theatre must serve society – that issue has been raised in public debate at least since the era of illuminism. Instead, its novelty has much more to do with Poland’s present-day social realities, where the words ‘public’ and ‘popular’ – freed from the ballast of communism and its propaganda – are crying out for fresh definitions. Thus, as Nowak outlined the shape of the new theatre and the role it had to play, he was quite in earnest when he urged it to combine the achievements of new aesthetics with social responsibility. The critic called for new theatre to be more than an opportunity for the director to show off her staging skills, and to become instead a spectacle capable of forging a successful alliance with its audience, thus filling the already sizeable gap between so-called commercial theatre and laboratory theatre. According to Nowak, unlike festival Parnassuses catering to small audiences, the new theatre is to be viewer-friendly and strive to overcome all possible forms of exclusion, whether related to class, generation, worldview or physical appearance. In alliance with the audience and through manifestations of local activism, the theatre envisioned by Nowak ought to search for a new shape of community that finds fulfilment in diversity.2 As can be inferred from his explication – which had been part of Nowak’s bid to become artistic director at the Polski Theatre in Poznań – these goals can be achieved by founding a public theatre council and by engaging various social groups, differentiated by age, class and profession. Without a doubt, those instruments are useful and resorting to them is no error. Nevertheless, public theatre doesn’t operate in an institutional vacuum: the way it’s managed and its (historically volatile) positioning in the context of various institutional frameworks not only constitute the ‘felicity conditions’ of any activity, to utilize philosopher J.L. Austin’s term, but also have a decisive impact on what we might call the mission of art in society. Thus it seems to me worthwhile to recall and take a closer look at the process by which Strehler’s ‘people’s theatre’ was established in Italy, and how it was the subject of critical revision in the 1960s. The purpose of such an examination would be to confront findings of that ‘revision’ with the current situation of Polish theatre, and to ask: what chances of success does ‘new public theatre’ have in present-day Poland? The idea of ‘people’s theatre’ is directly related to the foundation of Milan’s Piccolo Teatro in 1947. The Piccolo, one of Italy’s earliest institutional repertory theatres, was to transform the established shape of theatre in the country. Until the end of the Second World War, theatre in Italy had been based predominantly on a commercial, star-centred system; as for theatre companies, they were, roughly speaking, subject to the same laws as trading companies: they were profit-oriented and paid income tax to the state. Two decades of fascist rule aside, before the war, theatre had by no means been at the centre of attention for either national or regional / local institutions in Italy. Italian artists, for their part, didn’t really see the need for or the point of institutional patronage of any sort that would cater to their needs. As Strehler explained in a later collected-writings volume (dating from the early 1970s4), his theatre was also meant for people who to that point had scarcely any opportunity to see reliably staged Italian and world drama. This was because productions by existing theatre companies catered predominantly to the taste of bourgeois audiences interested in knockabout French repertoire adapted to fit the local context. The assumption was therefore that Piccolo Teatro would on one hand perform an educational mission, and on the other that it ought to carry out that mission in society by eliminating extant class divisions, and through specifying the repertoire on offer in private theatres (plebeian audiences favoured vaudevilles, while the bourgeoisie preferred comedies and farces). It was thus assumed that, being a public institution, the Piccolo was to be a democratic meeting place for members of different of social strata, all contributing to post-war reconstruction of Italian society and the state. Even this cursory presentation of the early days of the new Milan theatre makes evident that the Piccolo was meant to serve democratic society, in keeping with rules introduced by many similar institutions in Europe both before and after the war, including Germany’s Volksbühne, designed by Oskar Kaufmann (1914), the French Théâtre Nationale Populaire, founded by Jean Vilar slightly later than the Piccolo (1951), and the Berliner Ensemble (1949, 1954), formed at the initiative of Bertolt Brecht. But Strehler argued that as far as putting the idea of the ‘people’s theatre’ into practice was concerned, the director – a reader and exegete of dramatic literature, capable of staging it with sufficient skill to revive the collapsed art of Italian theatre, bogged down in its provincial, star-centred system – was an instrument as important as sources of funding or supervisory bodies. While it’s true that such assumptions may have sounded a bit dated in the context of late 1940s European theatre, in Italy the director was still an intriguing concept at a time when the entrepreneurial system known as capocomicato was only beginning to grow obsolete. This is why, during the Piccolo’s first decade, the repertoire put together by Strehler featured contemporaneous European and American authors: Jean Cocteau, Jean Anouilh, Ernest Hemingway, Jean-Paul Sartre, Eugene O’Neill. Chekov was staged, too, and Shakespeare – unabridged for the first time. Strehler called for rendering theatre more democratic and opening its doors to the wide masses of society. Still, the aim of the Piccolo founder was to mount productions that would appeal both to audiences locally (enjoyable, that is, for Italian people) and globally (perhaps more than anything else), granting the theatre recognition across Europe. Several years later, in the 1960s, this strategy brought on a profound crisis in Milanese theatre, most palpable on home ground. As a result, theatre-makers including Dario Fo and Franca Rame, who were keen to produce responses to pressing social issues as they arose, decided to part company with the Piccolo. This touches on an issue that was crucial to Strehler’s idea of how the new theatre would operate. The way the Piccolo was organized as an institution, combined with the need to present an ambitious, artistically demanding repertoire, concealed a fact passed over in public debate yet quite obvious: the existence of preventive censorship. The fact that the theatre system took on an institutional form was inextricably tied to a certain ideological pressure from those in power in Italy – the Christian Democrats, in government uninterruptedly until the 1990s. Through that period, the ubiquity of censorship cells in all state-funded arts organizations was an open secret.Strehler opted for repertoire censorship, difficult to object to on political or moral grounds, and that would gain recognition outside Italy. With the latter goal in mind, he staged commedia dell’arte and works by Shakespeare and Chekov. Clearly, during the two decades he was active at the Piccolo, Strehler successfully brought his ‘people’s theatre’ into being, combining artistic ambition with a new institutional shape. It was only in the 1960s, with the rising tide of social and ideological dissent, that it became necessary to thoroughly revise the assumptions on which Piccolo Teatro was founded. But to understand how the Piccolo’s crisis came about, we need to give some thought to the best known and perhaps the most frequently performed production in European theatre history: Carlo Goldoni’s Servant of Two Masters (1746), directed by Strehler. It premiered at the Piccolo in 1947, but the director staged it with some changes another five times over subsequent decades. The production’s most recent version, from 1993, is still performed at the theatre, though it’s been almost twenty years since the director’s death. Strehler would work repeatedly on the same dramatic material, seeking to achieve in his rendition the sort of mastery of direction – a term often used with regard to the Goldoni production – that would dazzle the viewer with the harmony and precision of a highly individual staging style. Strehler subjected Goldoni’s comedy to a suitable distillation process, purifying it of both the relevant historical context (the mercantile economy developed in eighteenth-century Venice was only one issue barely comprehensible after the Second World War) and the bourgeoisie ideology Goldoni very conspicuously incorporated into his text. For Strehler, the play proved a pretext for reconstructing historic acting craft in its essentially conventional nature, so it could become a kind of national cultural ‘brand’. A brand that would be evidence of the ‘uniqueness’ of the nation’s theatre, much like Italian opera and Russian ballet. Needless to say, Strehler’s reconstruction alluded to a certain notion of what such historic productions might’ve looked like (likely reference points being late sixteenth- and early eighteenth-century French etchings made after Italian comedians had been driven out of Paris). As Strehler acknowledged, his actors faced the absence of a living tradition, technique and suitable instruments.6 Thus his was hardly an attempt to recreate a historic model of mounting productions – instead, he attempted to implement a meticulous director’s vision (rhythm, set design, lighting, etc.) of the mastery of an art of theatre long forgotten yet peculiar to Italy. In this form, Strehler managed – very successfully, one must admit – to instil in the consciousness of domestic and European audiences a sort of pride and admiration for Italy’s national theatre culture, deftly subjected to the director’s will. However, as Roberto Tessari very lucidly observes, this model of theatre, aimed at broad audiences, eventually lost touch with local theatregoers, whose pluralist and inter-class makeup the locals were supposed to uphold. Milanese bourgeoisie and foreign tourists began to dominate Piccolo audiences. What’s more, as television began to develop in the 1960s, the problem of viewer migration escalated, as it was TV and its popular programming that essentially took over the role of staging productions ‘for the people’, contributing to the gradual undermining of theatre’s role as a meeting place for the civic community. In addition, in the 1960s, American theatre companies including the Living Theatre began to tour Italy with guest performances. On one hand, those companies called for transcending the boundary between stage and audience, explicitly encouraging audience members to engage politically, often resorting to physical contact for the purpose. On the other hand, those companies demonstrated that it was possible, even necessary, to return to a theatre model in which members were independent of institutional sources of funding and ready to form a community free from ideological pressure. Community integrity was upheld by means of collective ‘work’ on stage, and by spending time in one another’s company in so-called daily life, often away from institutional theatre, on the outskirts of cities and in various alternative spaces occupied temporarily and adapted to the demands of subsequent productions. Scandal and provocation were often an inherent feature of performances by American ensembles, as indicated by police interventions during Mysteries and Smaller Pieces in April 1965 in Trieste (where one actor appeared on stage naked) and in Venice that September after a performance of Frankenstein during the International Theatre Festival. In fact, after the latter performance, the Living Theatre was served with an order to leave Italian territory immediately. In the wake of these and other performances by companies regarded at the time as avant-garde – Jerzy Grotowski’s Laboratory Theatre (1965); Bread and Puppet and Cricot 2 (1969) – new models of building a relationship between theatre-makers and their audiences and organizing a company were introduced in Italy. There was also a new model for the role of theatre in culture: in the aftermath of those developments, audiences began to regard newly founded repertory theatres and directors’ theatres in major cities (Rome, Milan, Genoa, Turin and Naples) with growing mistrust. Strong polarization of political views in society – a problem affecting Italy and other parts of a world divided by the Cold War – fed into that mistrust. The result was that institutions which previously benefitted from the support of private and public capital soon morphed into representatives of the establishment, reviled by the Left. The outcome of all this was that theatres operating in Italy up to that point, such as the Piccolo, lost their social credibility, as it were, particularly when it came to representing the interests of the exploited social classes. A drop in season-ticket purchases and the fact that Piccolo performers were regularly being booed and heckled by their audiences demonstrated that confidence was diminishing in the institution of municipal theatres. As a result, artists including as playwright Dario Fo, who’d had strong links to the theatre, decided to leave it. Rather than staging ‘common’ or plebeian productions within the institution, as Strehler did, Fo began to practice ‘common theatre’, which sought to restore to contemporaneous urban spaces their function of an agora – that is, the place of public debate.7 In other words, it was assumed that the deinstitutionalization of theatre would restore the public mission it had lost over time. The kind of space a company occupied had a substantial impact on the quality of its mission and the goals it set. Theatre infected with Marxism, of which Fo was a prominent representative, sought to distort if not to radically transform the architecture of mature capitalism. Fo’s decision to leave the institutional-theatre circuit was, at the time, a way of redefining what was considered public within urban space. In this dialectic dispute, urban squares, tents, stadiums and factories could be regarded as public spaces. While institutional spaces such as repertory theatres had a statutory obligation to play a public role, they were in fact only serving the interests of a certain section of society – the section, obviously, that was at the helm of power and part of the bourgeoisie. Factory buildings and squares thus became the field – indeed, the stage – of political struggle, and not just due to productions mounted there. They also became the arena of a very literal struggle, a sometimes bloody fight between extreme left- and right-wing factions. This entire period from the 1960s through the following decade is commonly known in Italian history as gli anni di piombo [the lead years], with lead as an ingredient in bullets and bombs. It’s no overstatement when I say that theatre at the time found itself at the heart of the struggle for public space, its functionality and symbolic significance, sometimes facing police shields and batons or extremist-party hit squads in the process. Most of the time, however, theatre mustered strategies of a different order when faced with physical instruments of persuasion, eschewing violence in favour of political satire and similar means. 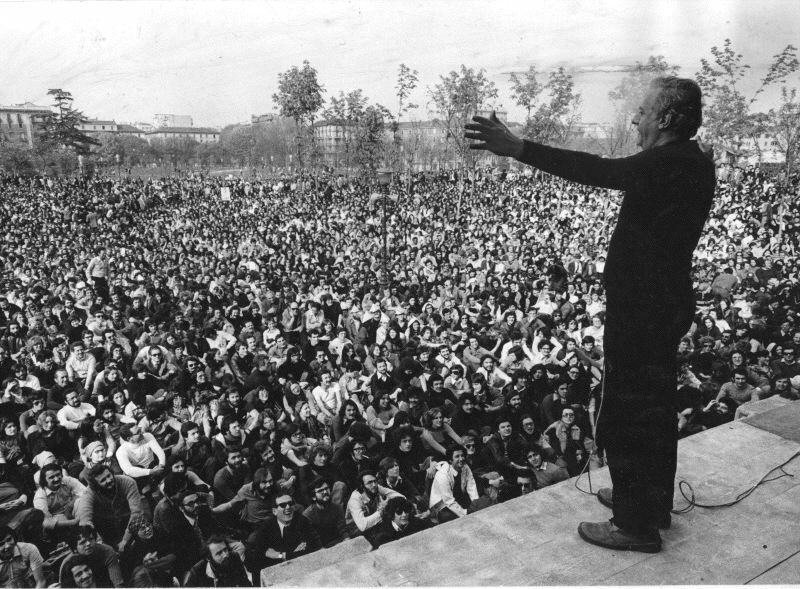 However, as soon as Fo began to sell tickets for his performances, the Italian Communist Party withdrew its support, arguing that his actions ran counter to Marxism-Leninism, no different from the capitalist-enterprise model Fo’s theatre was meant to fight. Undeterred by this lack of a party base, Fo transformed his company in 1971 into a new collective, La Comune. In 1974, Fo and La Comune took over another building in Milan, the Palazzina Liberty. In occupying that space, Fo specified in some detail how he intended to change the role of theatre in the urban context. To that end, he declared in a leaflet distributed among local residents that the La Comune collective planned to use the building to establish a self-funded structure that would be no stranger to local life. Instead of being an austere ‘arts organization’ that only maintained superficial contact with its audience, such a structure should relate closely to the political and cultural lives of residents in a given part of the city: theatre work aside, a library and a day club should also be set up as part of the structure; film screenings and theatre performances for children should be organized. In short, the money audience members spent on productions should be returned to local residents, responding to the needs of the moment. La Comune’s ambition was thus to implement principles of direct democracy and prompt local residents to take part in civic initiatives. To that end, the collective took over the functions of existing forms of social representation including the municipal authorities, replacing them with an alternative structure which, according to its founders, carried out its tasks more efficiently than the institutions originally established for the purpose. In the leaflets distributed among neighbourhood residents, Fo was quite clear in formulating tasks he posed himself and his collective as regarded the arts and the organization of political and social life. According to Fo, activity in the arts was to serve purposes of agitation and propaganda while organizational work was to provide the exploited classes with political representation.9 But in his report, an extension of the La Comune manifesto, Fo was less enthusiastic about achieving his ambitious goals. The organizational effort alone – founding La Commune units in various Italian cities and occupying vacant buildings such as Palazzina Liberty – yielded results only in Fo’s home city of Milan, but proved ineffective or short-lived elsewhere. Plans to transform theatre into a mass activity with broad impact also failed to materialize. Despite the fact that attendance was large for productions staged by Fo (particularly for Mistero buffo, perhaps the most performed 1970s production in Italy, with nightly audiences of several hundred and Fo taking to the stage to criticize Italy’s political establishment in a manner clear and easy for audiences to discern)10 representatives of La Comune were refused permission to enter schools and factories, for example. The latter lacked suitable structures for efficiently disseminating theatre culture among workers. Plans were made for the collective to be supplemented with a ‘worker’s commission’, a consulting body whose task was to ‘support comrade intellectuals in their efforts to make their points and formulate their demands clearly’. But, by Fo’s own admission, the commission proved an utter fiasco. Workers’ representatives weren’t interested in the least in joining forces with expert intellectuals to form lasting initiatives; they were even less prepared to formulate expectations about working hours, working conditions and pay in stage-parable language typical of artists working in theatre. Still, Fo’s endeavours to create a ‘new theatre’ didn’t go to waste. In the late 1960s, RAI, the Italian television network, could be seen to have done homework it had been given during the period of cultural dissent: it was quick to take Fo productions as part of ‘TV theatre’, ensuring that they really did reach the masses. It was television, too, that paved the way for the Italian song-and-entertainment scene: mass audiences were very keen to come see those they knew from television, including Fo and his politically éngagé theatre. In other words, in the space of twenty years, from 1947 to 1968, the idea of ‘people’s theatre’ migrated from the context of institutional theatre through off-theatre to Italian television and stage. The example of initiatives undertaken by Strehler and Fo demonstrates emphatically that the goals of bringing theatre to the masses, which artists set themselves as part of their work, aren’t always attained in accordance with assumptions made by the artists; alternatively, they gain unexpected power and unpredictable effectiveness in an entirely new dimension. Strehler and Fo, each in his own way, attempted to anchor theatre work in the social and urban tissue, and each discerned, in keeping with his own principles, the significance of theatre as a meeting place for the civic community. However, as I’ve tried to elucidate, changing social, cultural and political conditions have to a great extent influenced the fact that theatre as an institution, though initially enjoying high levels of trust in society, as the Piccolo Teatro had during its first twenty years, has gradually come to lose that trust. By contrast, Fo’s undertaking, though seemingly more ephemeral and more independent, proved more effective in terms of putting an artist in a position of authority in society – an artist who, through her performances in public spaces, restores to these spaces their original function of an agora, a meeting place, a sphere for discussion and public debate. This is why theatre’s mission in society must be regarded as a performative process that needs to be constantly updated and revised in a dynamically changing context. And it seems that these slightly disappointing conclusions that can be drawn from experiences of Strehler and Fo are borne out by the fact that theatre scholars remain reticent about the very possibility of gauging theatre’s effective impact in short and long terms. How, as Erika Fischer-Lichte asks, is one to verify to what if any extent attitudes, political views and behaviour have actually undergone an enduring transformation?11 And how, we might add, is one to verify whether a new, pluralistic, inter-class community has been successfully formed in relation to theatre? These questions should probably be left unanswered, at least for the time being. Still, a comparison of the strategies of Strehler and Fo also yields a few heartening conclusions. First: the institutional base of theatre provides a crucial framework for its influence, though, as I’ve tried to demonstrate, that base may take different and at times even radically oppositional forms, depending on the circumstances and point in history. At one time, ‘people’s theatre’ will need funding from the state or regional purse; on another occasion, it may operate according to rules of capitalist enterprise, as was the case with Fo’s venture. It’d be difficult to argue unequivocally that being governed by a commissioner will invariably guarantee that a theatre will forge an alliance with its audiences. Second: one must not forget that theatre’s place in the life of society and its institutional base must confront in equal measure the viewer in the here and now, and the realities of television and other media. These newer media, without a doubt, have taken over from theatre its function of an agora, a place for exchanging views. Since the 1970s, they’ve also contributed to the emergence of a new performance space known as the song-and-entertainment stage. This space for mass entertainment and social satire – a form in which Fo, for one, was quite conversant – while frequently passed over and looked upon with disdain by theatre scholars, remains that democratic, inter-class meeting place. 1. Maciej Nowak, ‘My, nowy teatr publiczny’, Dialog, 6 (2016), pp. 5–11. Published also in this issue: www.polishtheatrejournal.com. 2. Nowak, ‘My, nowy teatr’, pp. 10–11. 3. Roberto Tessari, Teatro Italiano del Novecento. Fenomenologie e strutture 1906-1976 (Florence: Casa Editrice Le Lettere, 1996), p. 83. 4. Giorgio Strehler, Per un teatro umano: pensieri scritti, parlati e attuali (Mila: Feltrinelli, 1974). 5. Tessari, Teatro Italiano, p. 83. 6. Strehler, Per un teatro umano, p. 170. 7. Giorgio Strehler left the institutional Piccolo Teatro for several years and turned to socially éngagé theatre with students of the Piccolo’s drama school, Teatro e Azione. His initiative failed to attract audiences and faded, and Strehler returned to the Piccolo Teatro as its sole managing and artistic director. 8. Both audience and ensemble members were organized in cultural associations, usually attached to party structures such as the PCI, the Italian Communist Party, in an attempt to avoid police intervention during performances with an unequivocal political message. Only association members with suitable identification were allowed to enter the theatre. However, a conflict broke out between the ARCI and Fo’s first ensemble as soon as the latter party decided to sell tickets for their performances – which is precisely why PCI withdrew its support from Fo’s initiative. See Tessari, Teatro Italiano,pp. 131–132. 9. Lanfranco Bini, Attento te…! It teatro politico di Dario Fo (Verona: Bretani Editore, 1975), p. 72. Quotations translated by the author. 10. See Tessari, Teatro Italiano, p. 132. 11. Erika Fischer-Lichte, The Routledge Introduction to Theatre and Performance Studies, eds. Minou Arjomand, Ramona Mosse, trans. Minou Arjomand (Abingdon, New York: Routledge, 2014).